Yeah, so…”Robot Suit Batman vs. Giant Robot Suit Joker” happened here. The issue has a lot going on beyond that. But that’s the element people will remember about this issue, and perhaps this story as a whole. 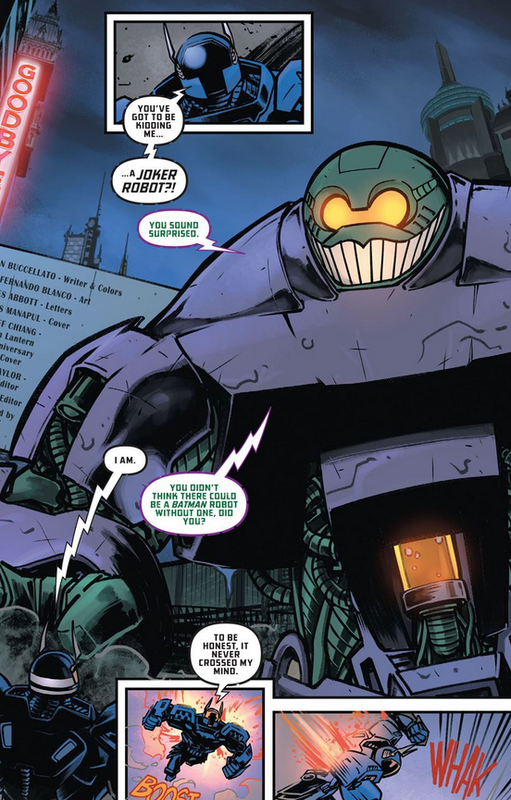 Using the power core from Batman’s suit, Joker’s Daughter has somehow created a giant Joker-bot to terrorize the city. Naturally, Gordon and the GCPD are there to stop her. 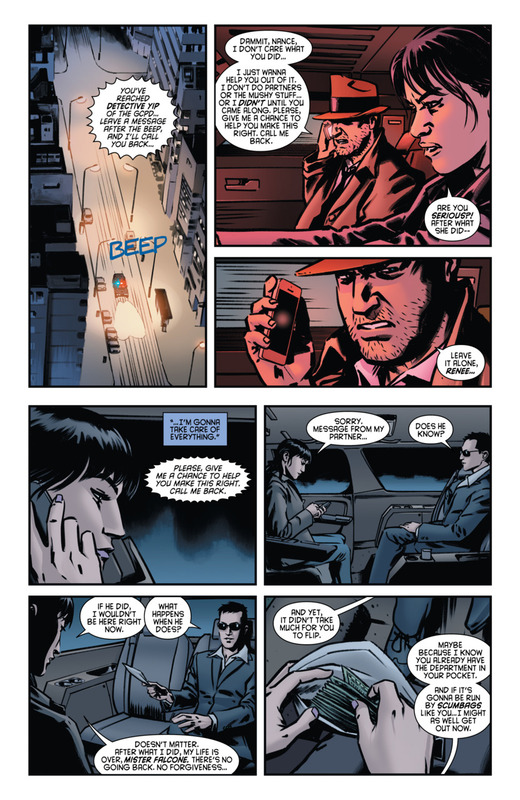 In our villainess’ own words: “Nothing says Gotham more than Joker and Batman!” But there’s also a battle being fought within the GCPD over Harvey Bullock’s partner Nancy Yip, and her connection to Stefano Falcone. Are Bullock’s romantic fillings for Yip clouding his judgment? And how has he enlisted Gordon’s help? But the real meat of this issue comes from the Bullock/Yip stuff, and what they do about her. Last issue, Bullock asked Gordon to “Help me kill my partner.” That’s a heavy thing to ask from Batman, of all people. But Gordon does play his part, though not literally. Once gain, this book shows us the differences between Gordon’s Batman and Bruce Wayne’s Batman. Their moral compasses are pointed in the same direction, but their means of getting there can be very different. What happens with Yip speaks to an inner pain that most writers give to Bullock. They weren’t soulmates, but Bullock doesn’t usually get romantic interests. So it’s sad to see things go the way they do. Bullock certainly isn’t the most charming guy we’ve ever met. But like all heroes, we want him to succeed and achieve happiness. Yip could have been part of that for him. But alas, she isn’t. Image 1 from adventuresinpoortaste.com. Image 2 from darkknightnews.com. 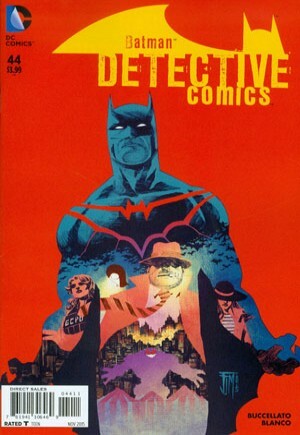 This entry was posted in Comic Books/Graphic Novels and tagged Bat Cop, Batman, Brian Buccellato, comic book reviews, Commissioner Jim Gordon, DC Comics, Detective Comics, Fernando Blanco, Gotham City, Harvey Bullock, Jim Gordon mohawk, Joker's Daughter, Nancy Yip, Renee Montoya, single issue reviews, The Joker on 09/08/2015 by primaryignition.